Eat, sleep, work, crochet. Such is life. I don’t really have anything to say, because I’m spending all day packing in preparation for our move tomorrow. Kind of in a weird emotional state right now. 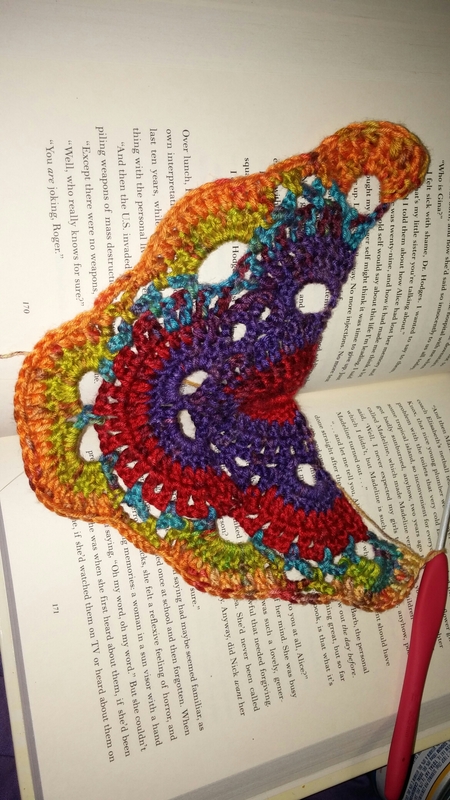 So I wanted to share shawl progress pictures to make myself feel accomplished and happy. The beginning, last night around 8ish. Minutes later, realizing how cool this could be. 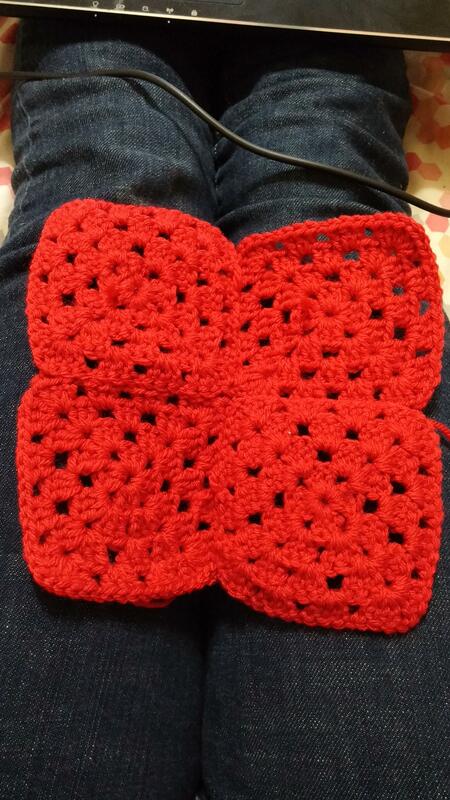 Also, I don’t like that I started on red because this is a weird color repetition. Purple is one “end”, the other is yellow. 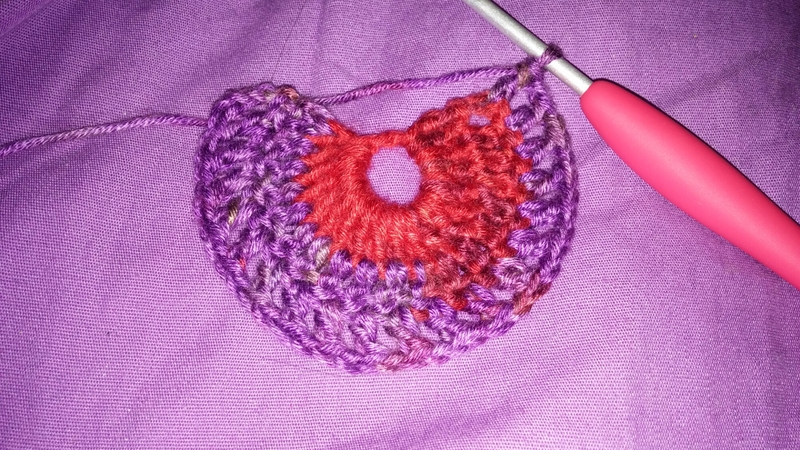 And it goes back and forth, like 1 2 3 4 5 4 3 2 1 2 3 4 5…so I started out with red, purple, back to red. Just bad luck. But anyway, moving on! I can’t turn the picture for some reason, but it works. This is when I realized it was going to be gorgeous. I love it. This is why I love colorful yarn, summed up in one picture. Also, the green is not that yellow in real life. Just saying. This rug is AWESOME. I know that in the middle of every single project, that one becomes my favorite ever. But I don’t care. This one really is my (current) favorite ever. That impulse rug is seriously taking shape. Sadly, I’m almost out of the blue yarn. So I’m crossing my fingers that it’s Red Heart With Love. I’m going to keep the last few inches, and bring it with me when I go to Hobby Lobby on Monday. Hopefully I can find the right thing! That was really all I had to say on the matter. Look at it. It’s more teal than green, but other than that it’s just as pretty as this picture! 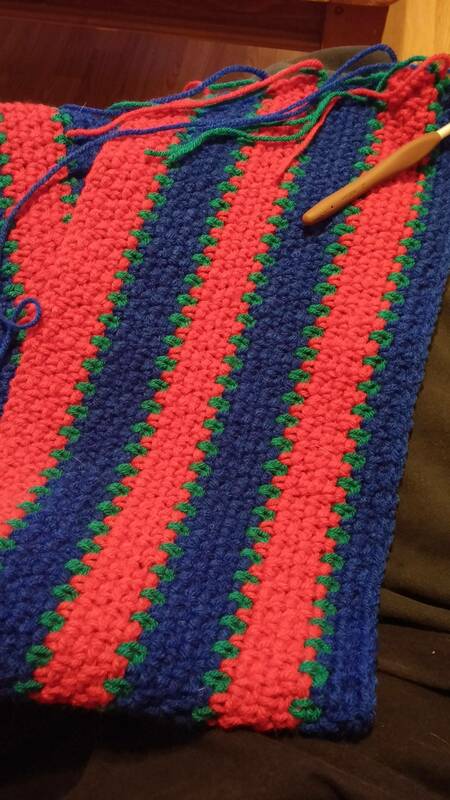 I’m going to finish my star blanket today. I started the last skein last night. It’s about halfway gone. 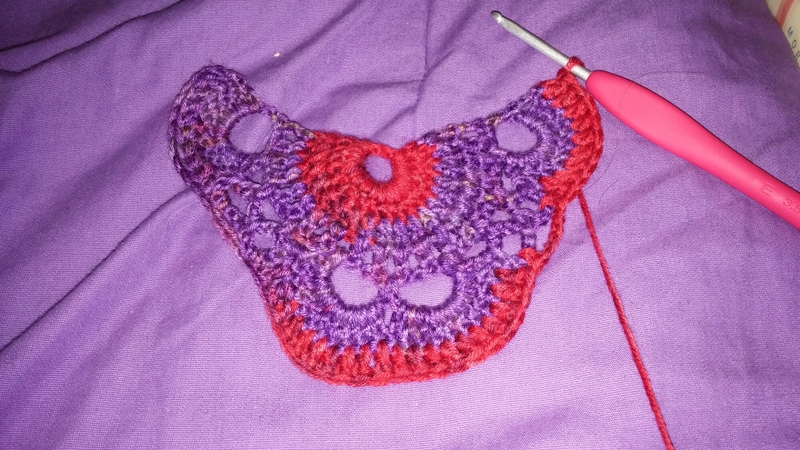 So once I pick up the project shortly, I’ll probably just keep going until I finish that skein and run out of yarn. It’s probably about 2/3 the size it’s supposed to be. I’m not sure what I was thinking when I found the pattern/ordered the yarn, I honestly don’t know if I bought the amount that the pattern called for. I don’t even know how many skeins I used. 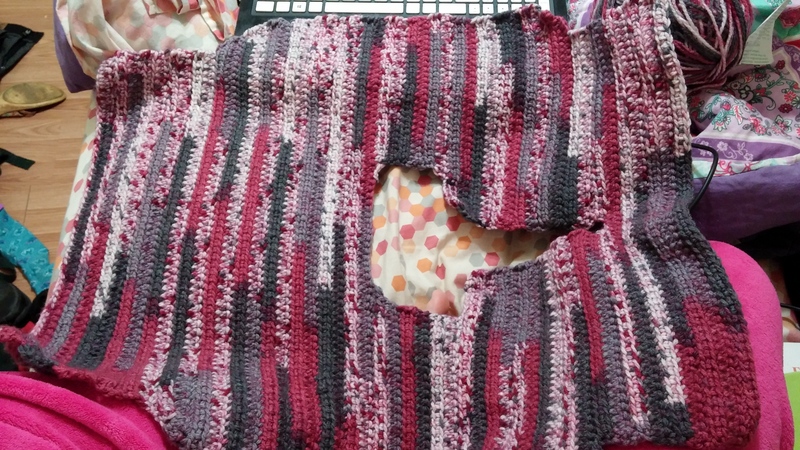 But it’s definitely big enough for a cozy lap blanket, so I think my friend will enjoy it anyway. The pattern wants it to be pretty big, too. But it feels weird. I’m procrastinating picking it up and starting, because then it’ll be done. And although it’s always nice to finish a WIP, this is my first completed blanket. 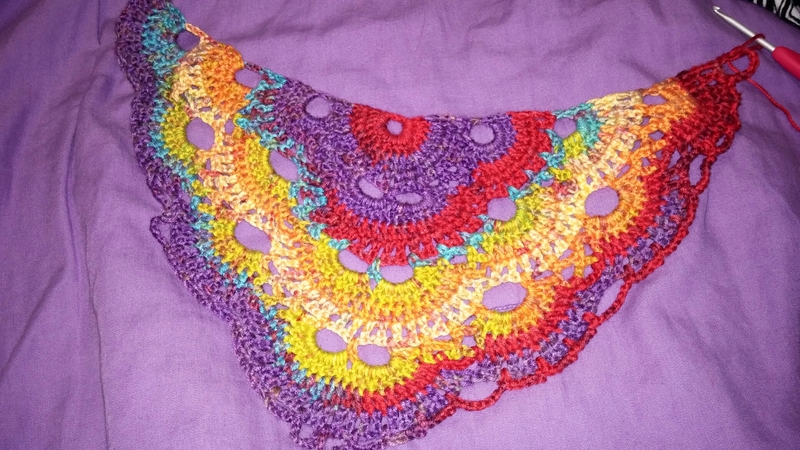 A lot of work and a lot of yarn went into this. And I’m just giving it away for a friend’s wedding gift. I’ll update with pictures within a couple hours to prove that I finished a blanket! So I was being dumb. My first intention with this Captain America blanket was to make all the squares. 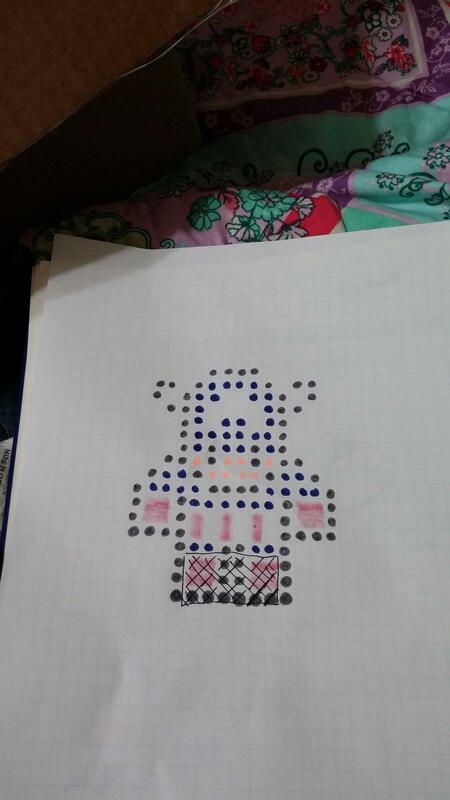 Yep, that’s right…All 300+ squares…before joining them. I honestly planned to have this giant box filled with little granny squares, and then join them up. Or the bottom 2/3 of his legs, at least. And the border at the bottom, plus the blank space between his legs. It’ll look cooler with the rest of him attached, I promise. Or I hope. Maybe that’s what I meant. Anyway, this makes it much easier. 1. Fewer squares in a random pile in what I have deemed my “Captain box”. 2. It’s not a WIP anymore…it’s a superhero taking shape. Honestly, I now feel guilty that he doesn’t have a body. I can’t do much more besides finish off his legs and the border around them, but it feels like enough for now. Then I’ll need more yarn, and that’ll have to wait a while. We’re broke right now. 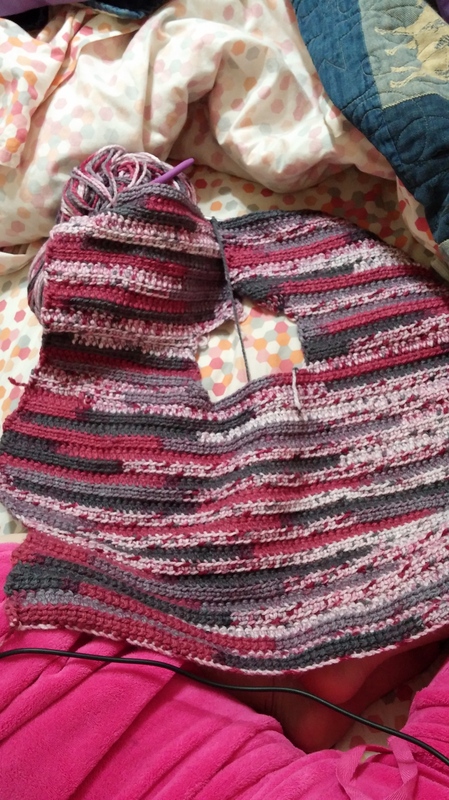 I had bad timing in re-discovering my dedication on a WIP of Knitpicks yarn. Oops. For progress marking, here’s the plan with what I have done X-ed out. And, of course, I feel the need to point out that there will be a border too. I’m quite proud of it so far, though! Alright, time to go make pathetic money on the internet for my yarn addiction. See you! I have big, super exciting news. Really, it’s the most exciting thing that’s happened to me all day. Probably in the last few days, even. Captain America has a fist! 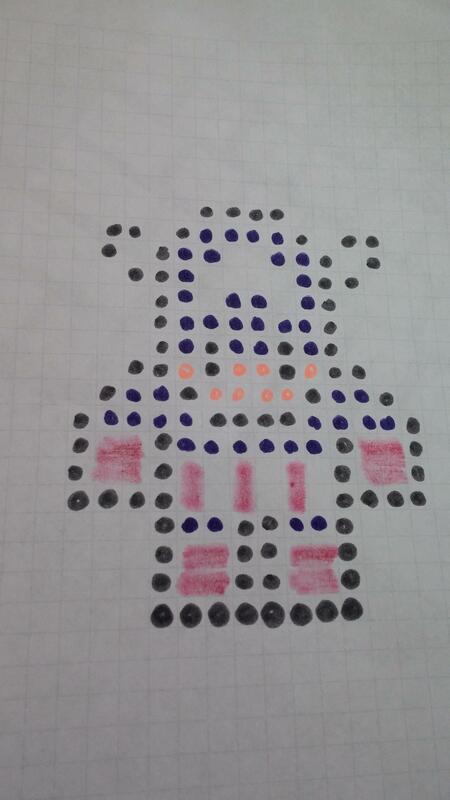 I should probably remind you of the context…I’m making a pixelated Captain America blanket out of granny squares! 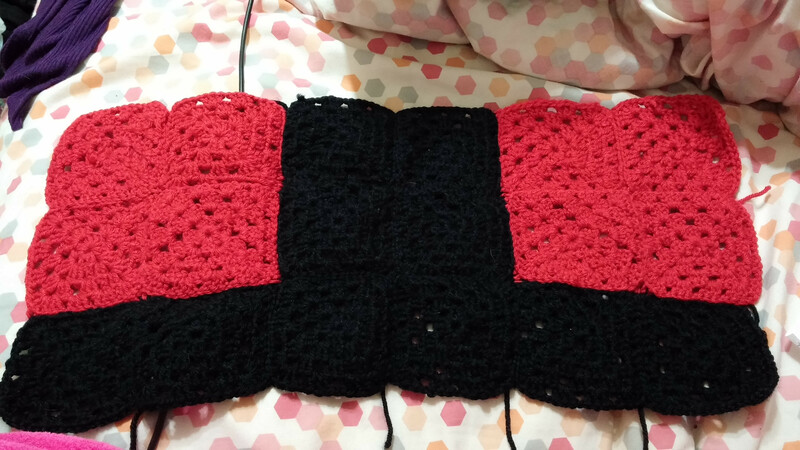 I have all the red squares done, about half the blue (need to buy more blue), and I just started the black. 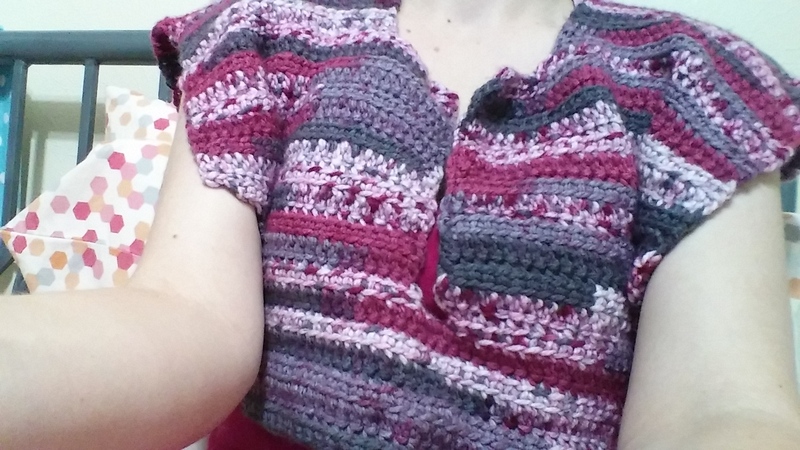 I need to order more yarn, but I chose to use Knitpicks worsted for this, so I can’t just buy more on a whim. That’ll take some saving up. But I got impatient, and didn’t want a giant pile of squares. So I’m joining up what I can! I’m using a cool joining method that only shows from the back, so I can do it this way and then just keep adding the blocks around it as they exist. Time to make another fist, and some stripes from his belt! My marker supplies were limited, shut up. You can see that the red/pink is nearly dead. And I didn’t have a skin color. And it looks weird close up…back away from your screen a lot, and it looks cooler! There will be a gray background as well (or another color, but that’s the best I can think of for now), but that didn’t really need mapping out. Alright then, I’m gonna go join together another fist! And then probably part of his helmet! The chest/torso thing is actually a finished piece now! 3. The colors look pretty cute! After spending a good part of the last 24 hours working on this (except for a work shift and some sleep), my first crocheted sweater is almost kind of taking sweater shape! It was really hard to take a picture. But essentially, this is the body/torso part. That square in the middle is the neckhole, and the weird shapes on the side will seam together to form the sides and two armholes. And I think the sleeves will be done in the round from those once it’s seamed together? This pattern is complicated enough without reading ahead. And that’s not an insult to the pattern, it’s just a complicated project. Which I really enjoy–I’m kind of tired of projects involving 75 rows of the same thing in a row (I’m looking at you, shawls/scarves!). I think that’s why I’ve been able to stay dedicated to this sweater. That’s it for now, this is the only thing I’m working on right now (I’m getting better about dedication to one WIP at a time!). See you later with (hopefully) more sweater updates!